This men’s facial lotion is specifically designed for use with facial hair thanks to its lightweight texture and rapid absorption. It does not leave any residue and can also be used after shaving thanks to its soothing properties. Its formula, containing the active ingredients of 20% aloe vera, hyaluronic acid, bisabolol and vitamin E, makes this the ideal product for moisturising and improving the texture of the skin while also increasing its elasticity. It is also antioxidant and contains a solar filter. 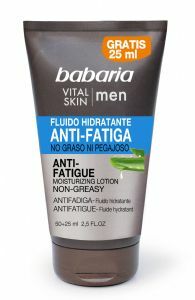 For optimum results, combine with other products from Babaria’s range for men. Aqua(Water), Aloe Barbadensis Leaf Extract (Puro Aloe Vera 20%), Glycerin, Bis-PEG-18, Methyl Ether Dimethyl Silane, Octocrylene, Decyl Oleate, Parfum (Fragrance), Sodium Hyaluronate, Bisabolol, Tocopheryl Acetate, Phenoxyethanol, Sodium Carbomer, Alcohol Denat, Xanthan Gum, Tetrasodium EDTA, Acyrlates/Vinyl Isodecanoate Crosspolymer, Etylhexylglycerin, Menthol, Citric Acid, Ascorbic Acid, Sodium Sulfite, Sodium Benzoate, Potassium Sorbate, Hexyl Cinnamal, Citronellol, Linalool, Citral, Limonene.